The answer is: by using the Cut and Insert functions. Let’s begin by opening a screen and a report. First let’s open the Filtered Zacks Rank5 screen as an example. ‘bt_sow_filtered zacks rank5’ screen and then click Open. Your Screen is now loaded along with its accompanying Report. If you want to move one of the items elsewhere in your report, just follow these steps. In this example, let’s move the Zacks Rank item so it appears before the Current Price Item. Then, left-click on the item where you want the other item to appear in front of, i.e., to the left of. In this case, left-click on the Current Price item. Once again, a small marquee will surround the item you clicked on. The Zacks Rank was positioned after the Avg Daily Vol item. Now it’s in front of the Current Price item. Note 1: By default, all reports include the Company and Ticker items. These items cannot be deleted. And other items cannot be placed in front of them or between them. Note 2: Do not Cut and Paste or Copy and Paste when trying to move items around. This will simply paste the item over the other item. In other words, it’ll overwrite that item, essentially removing it from your report. The proper way to rearrange a report is to Cut and Insert. You’ll also notice there are several other items to choose from on the Edit Menu. Let’s review all of them. Modify – you can change the item’s column name, alignment, format, time period and calculation. 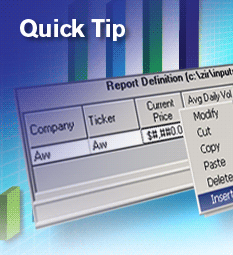 Cut – removes the selected item from the Report Definition table and places it on the clipboard. Copy – copies the selected item to the clipboard. 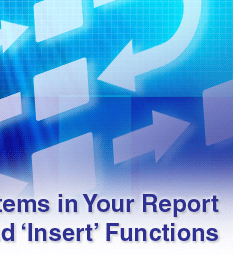 Delete – permanently removes the item from the Report Definition table. As you can see, editing a report is quite easy. 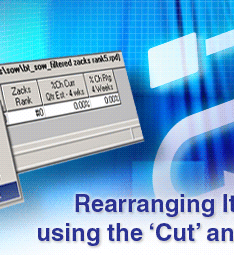 There are lots shortcuts and conveniences built into the Research Wizard. You’ll discover many of them on your own by exploring the program. We’re also committed to bringing them to you through our Tips and Tricks articles like this one. For even more resources and help on using the program, check out our Tips and Tricks on ‘All of the Available Resources for Help in Using the Research Wizard’, Issue #16. Get the most out of the Research Wizard today.